La Belle Alliance Cemetery is 3.5 Kms south of Boezinge and the same distance north-east of Ieper. It stands on the Zwaanhofweg, and is best approached via the N908 Ieper by-pass turning off north at the junction with Briekestraat-Zwaanhofweg is then the first road on the left. La Belle Alliance Cemetery was made in February and March 1916, by the 10th and 11th King's Royal Rifle Corps, and was used again in July and August 1917. It was originally named from a farmhouse which stood close by. The cemetery contains 60 First World War burials, ten of them unidentified. The cemetery was designed by J.R. Truelove. 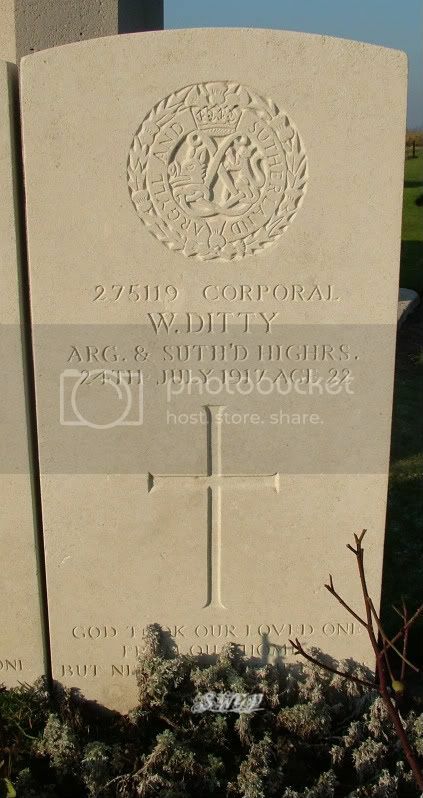 Photograph kindly supplied by War Graves Project Member 'Boyentrant'. Additional information: Son of Frederick and Margaret Ditty, of 101, Barrhill, Twechar, Glasgow.